Earwax candy, delicious. Who hasn't cleaned out their ear, and sucked on the q-tip? It's about time they make it a candy. I am constantly fishing out old diapers from the dumpster. These will save me a lot of hard scavenging work. 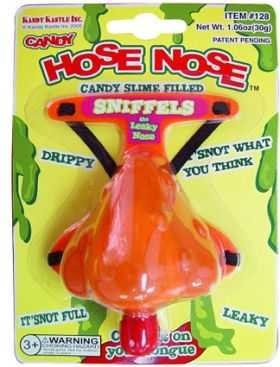 You strap this on to your face, and eat the candy as it drips and squirts out. 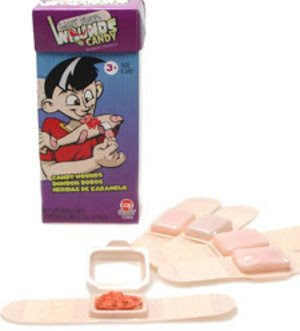 I have seen lots of young kids licking the snot off of their faces, I had no idea that it tasted great. Lemon flavored pee candy. 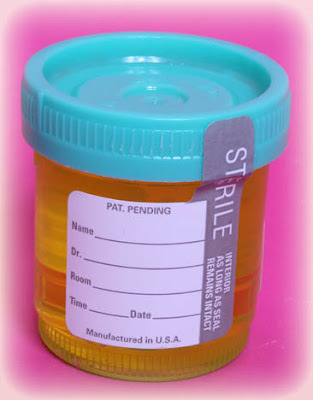 You can swipe one of these from your doctors office, but I can't guarantee it's lemon flavored. Gummy earth worms. Those birds in my garden have been onto something this whole time. 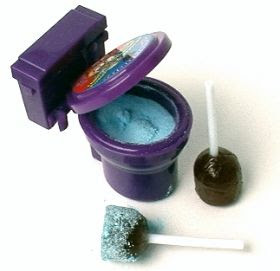 A little toilet filled with sour candy. They should make the sucker in the shape of a toilet plunger, or a toilet brush. Then they would have something. A Harry Potter Cockroach Cluster. Looks pretty realistic, but I bet it tastes better than the real ones in NYC. 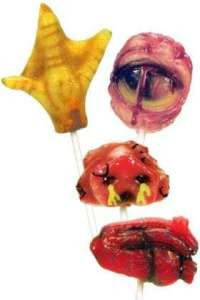 From the show Fear Factor, comes a custom line of candy. 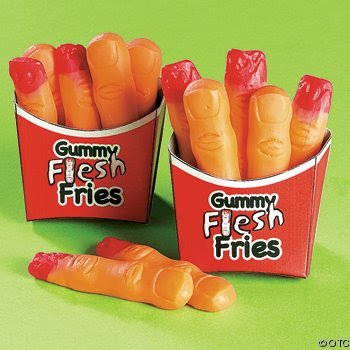 Flesh Fries. My shop teacher was missing a finger. I wonder if he ate it? Blood balls. 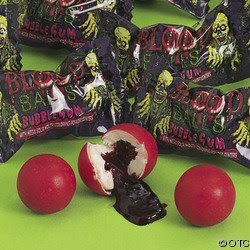 I dunno, I guess I just don't like the idea of a squished ball squirting blood. Zit Poppers and a box of boogers. 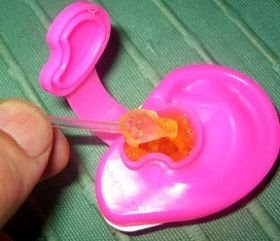 You can squirt out delicious goo from the zit gummies. 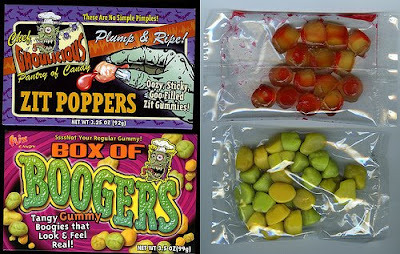 The boogers are supposed to be tangy, and look real. I guess they look real, if you stick pistachios up your nose. 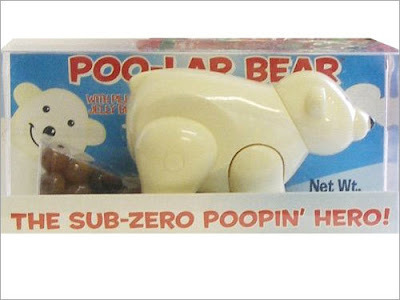 Sure, polar bear poop, why not. So, I think I speak for everyone when I say that eating a band aid you find in the trash can is delicious; but do you really think they could replicate the delicious copper/iron taste? 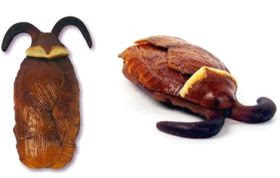 Wow, really disgusting looks on candies you have. I really love candies with a different looks on it. 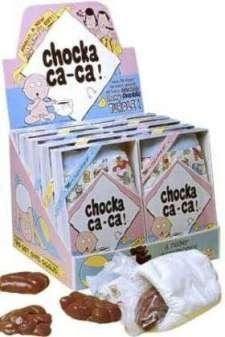 I makes me remember one of my favorite retro candies before. You have a nice blog about candies. eww gross. where can i get this stuff?!?!?! my best bud and i would love this stuff, and were girls!!!! Omg! I've eaten the toilet one before! Though I didn't really understand/care what I was eating out of cuz I was really little. I just wanted to get to the candy, The earth worm's not that gross actually, it's basically a huge gummy worm...come to think of it that is kinda gross.